Prolly most pinoy watched because 1. It's not the typical western characters for a hollywood film and 2. Curious about Kris' appearance. I agreed, I watched the movie because of curiosity about Kris. The movie isn't new to us Filipinos. we pretty much know the Chinese tradition about money and marriage but it's an eye opening for the westerners. Bitter si 12:23. Ano ang bubog mo kay Kwan? maganda din naman ang book. Well written.I also liked the movie.BAsta bida mga Asians. Most people didnt even know CRA is part of a trilogy and that theres no princess intan in CRA. Walang mabalitaang napaguusapan ang trilogy. Do you honestly think 100k people read the book here? 1:42 have you read the book? Princess Intan exists. She even has a scene with kitty that did not make it in the film. What’re you talking about? Dami nga nagsasabi the film version was way better than the book. Wag mong lahatin. I didnt watch cause of kris. I watched kse ive read all of kevin kwan’s book. And mas bonggels ang book sa movie. Sa true lang! That's not Princess Intan. That's the Sultana of Borneo. 3:36, the sultana had a scene with kitty, never with rachel. 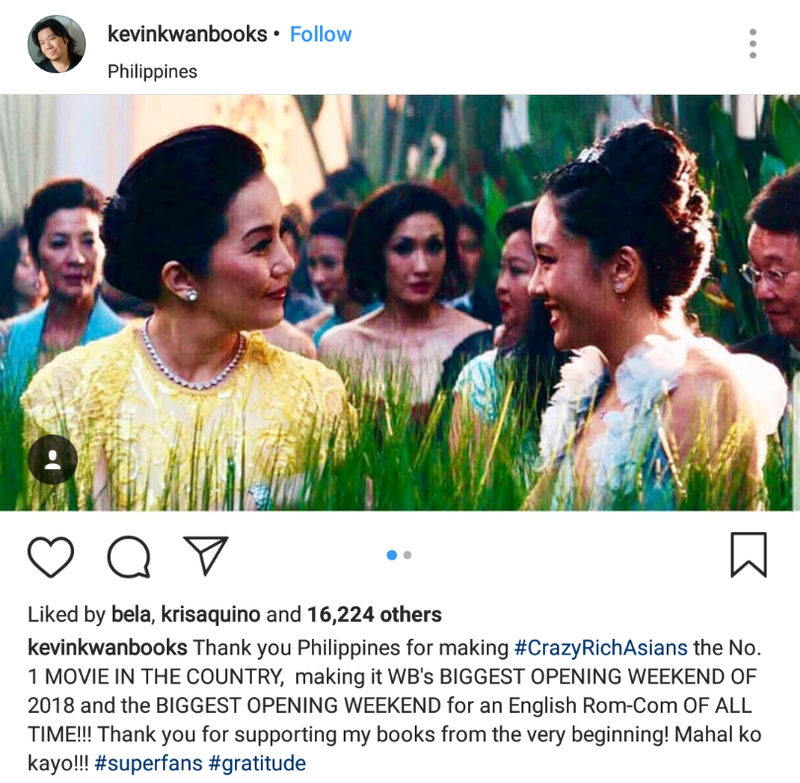 Yung scene sa movie- walang ganun sa libro. Movie rachel had an actual intelligent conversation with someone. Book rachel never did. Ay grabe ang bitterness..di pwede maging masaya na lang? Korek! Wag na crabby mga Pinoy. Shame shame on us pag gantay tayo. Maging masaya for a racist book? Seryoso ka? 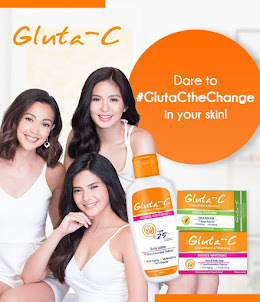 Ang ganda kaya! Even my foreigner husband n pa teary eyes sa #CrazyRichAsians and he is not really a fan of Romcom movies. OA ka. Nothing in the movie that was moving. 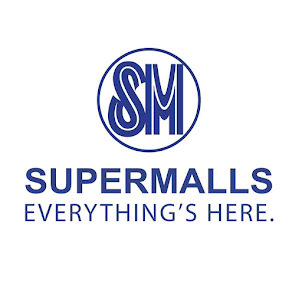 Alangan naman magpapaiwan ang ibang Pinoy na mahilig sa hype. Kahit wala si Kris jan, kikita pa din yan. Pero naka tulong paandar ni Kris na mas OA pa sa nga bida. My friends & I watched here in the US because of Kris. 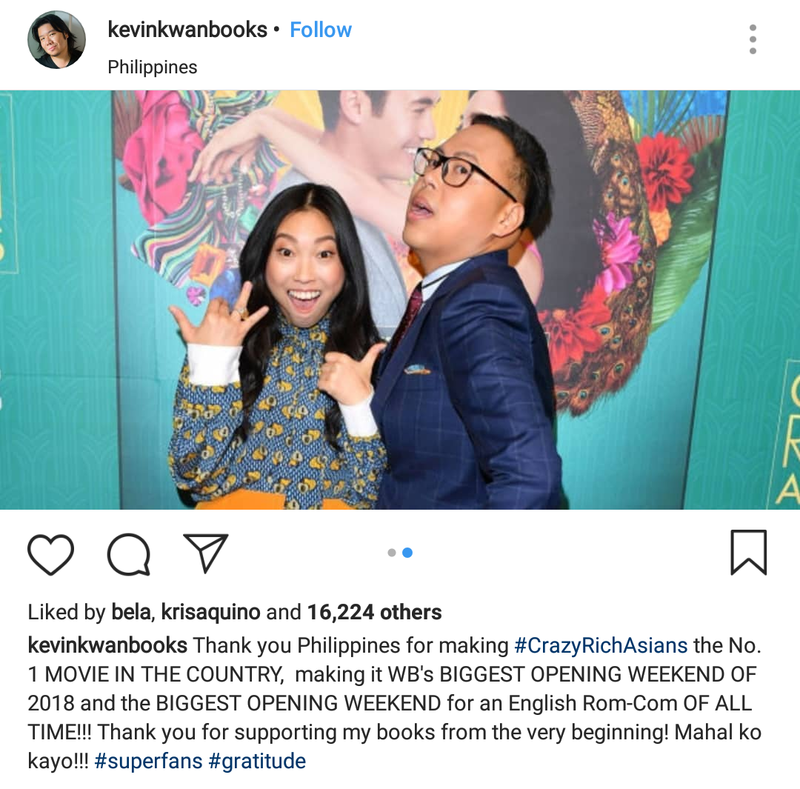 Curious ako sa role ni Kris so her appearance kahit short ay nagdala ng maraming moviegoers. Proud of her short but grand appearance in the movie. I live in Toronto and saw the movie because of all the hype brought on by Kris Aquino. I’ve heard of the book but never read it. All these crabs have to admit that she not only played a great part in the movie but also in the movie’s huge sales! Haters gonna hate!!! Di matatawwaran ang daming pinoy na nanood specially in california area. I heard sa ibang lugar din ng US at CANADA. Pinoys were there not because of the book but because of the kaoahan ni krissy. so congrats madam ikaw na talaga! We watched it because of kris. It will be a hit with to without Kris.. I hope ting say ni Kevin Kwan... But Nico Santos made us filipino proud. The only pinky in the cast. It was really nice of him to thank and acknowledge the fans that watched it but why are there still people hating and being bitter. Can’t we say good things back?! I cannot! I didnt read the book. I wanted to watch dahil sa all asian cast. Ewan ko ba sa iba... nagpapasalamat na nga yung author dami pa sasabihin. Pag di nagpasalamat or na acknowledge magagalit din. Ay mga pinoy kelan magbabago? Nag-Thank you na nga dami pa rin satsat! Anoba gusto nyo? I like the movies kasi realistic kesa sa action o superheroes. Culturable value is well presented. Fave charcters ko si Peik Lin at ken Jeong. TEH.pakibasa yung comments. Walang nambash ng movie. Yung book kasi ang chaka at racist, ok??? Reading comprehension fail! I watched the movie to compare it with the book & I personally liked the book more than the movie. My whole family watched because of Kris. We were 12. We were all anticipating Kris's appearance in the movie. We watched in Toronto. Daming Pinoys sa theater. I definitely watched it (twice!!! )because of the books! The story was such a standout I was thrilled when I learned they were making a movie based on the book. Indeed the book had so many details that the movie could not include but I was entertained by the movie! Till the next one!!!!! dito sa Pilipinas punuan din ang mga cinemas lalo na sa bandang BGC at Makati hanggang last full show walang seats.